The road to Marfa may be long and flat, but payoff comes in the form of intergalactic skyscapes and dusty purple mountain vistas, maybe even a double rainbow if you’re lucky. Located roughly 400 miles from both Austin and San Antonio—and about 60 miles from the Mexican border—this one-stoplight community maintains its ghost town feel despite the presence of a gemstone shop, a tiny natural grocery store and a late night grilled cheese counter filled with vintage TVs. 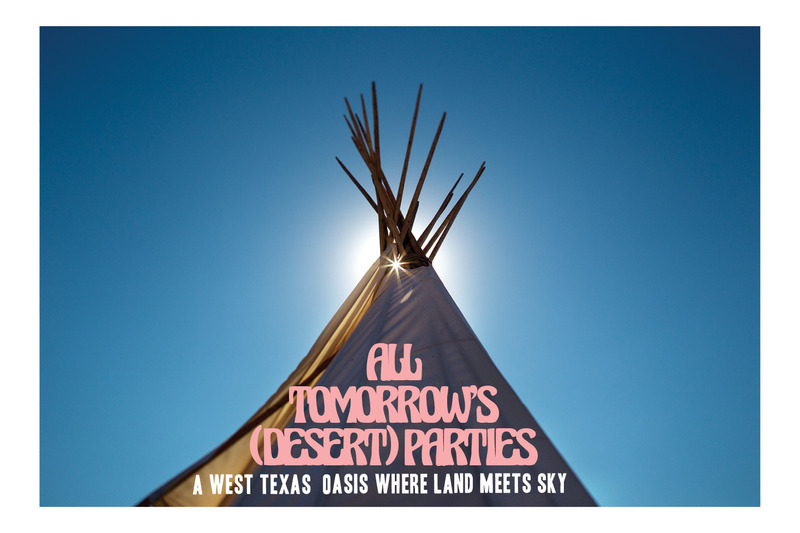 While contemporary art events at the Chinati Foundation and the acclaimed Marfa Film Festival attract artists and bohemians from across the country certain times of the year—as do the famous and unexplained Marfa Mystery Lights—El Cosmico has made the quirky West Texas town a year-round destination. The campgrounds and community center are curated by lifestyle guru Liz Lambert, the hotelier behind Austin’s hip Hotel Saint Cecilia and Hotel San Jose, as well as San Antonio’s Hotel Havana. Set on 18 acres in the high plains desert, the nomadic oasis allows guests to camp in their own tent or opt for a spacious 22-foot Sioux teepee, Mongolian yurt or one of seven refurbished trailers from the 1950s, outfitted with creature comforts like vintage serape robes, a Chemex glass coffeemaker and a Geneva sound system. El Cosmico is host to a number of events throughout the year, such as Big City Camping Cooking, a weekend-long outdoor cooking workshop led by Liz Lambert’s brother, chef Lou Lambert, and his partner James Smith; Camp Design Build Adventure, a four-day community-focused design immersion; and the pièce de résistance, an annual music and lifestyle festival called the Trans-Pecos Festival of Music + Love. This year’s featured musicians will include Calexico, Neko Case and Nathaniel Rateliff & the Night Sweats, and workshops will range from welding basics to botanical beverage curation. Campers may rise early to do yoga, jump in on a ‘90s jazzercise class, take a leisurely medicinal plant walk, or simply soak in a wood-burning hot tub. Although events like the Trans-Pecos offer plenty to do, Lambert hopes visitors get just as much out of doing nothing at all. In fact, she’s written a “Mañanifesto,” detailing that very sentiment. For more information on El Cosmico and the upcoming Trans-Pecos Festival, visit elcosmico.com. This article was originally published in RANGE Magazine Issue Five.